One of the fun features of Blogger allows you to choose from a number of templates for your blog. The template determines both the look and feel of your blog as well as how the blog elements appear on the page. Blogger has many templates to choose from, and don’t forget that you can customize or change the template later if your first choice no longer looks as fresh in six months. From the Dashboard, select Template from the Posts drop-down list. Use the scrollbar to browse through the available templates in the Choose a Template screen. The previews on this page give you an idea of how your blog would look if you used the various templates. When you find something intriguing, click the thumbnail image. A larger image of the template opens in the window so that you can take a closer look. You can preview as many or as few templates as you want. To close a preview without implementing the template, click the X in the upper-right corner of the preview window. After you decide on a template, click the Apply to Blog button on the preview window or click the Apply to Blog link under the template thumbnail. 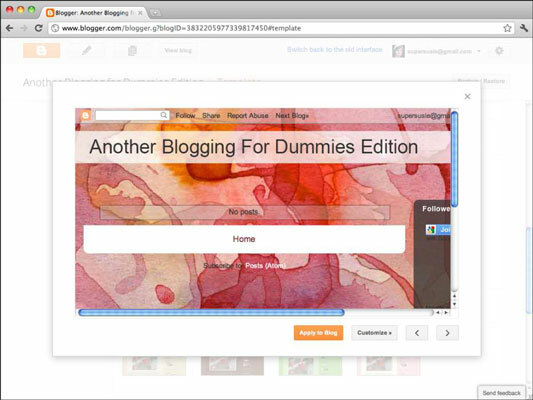 Blogger displays a confirmation message that the template has been implemented on your blog. The Layout area of Blogger gives you, the blogger, a ground-breaking tool that allows you to have detailed control over the layout and look of your blog without requiring you to become an HTML guru and stay up late figuring out the intricacies of web publishing. This kind of editing control reflects the growing do-it-yourself attitude found in the blogosphere: Bloggers want sites that reflect their own sensibilities, but not everyone has the time to become an expert or the budget to hire one. This access also reflects the growing expertise of many computer users who can edit photographs and create graphics, and it gives them the capability to make the most of those skills. 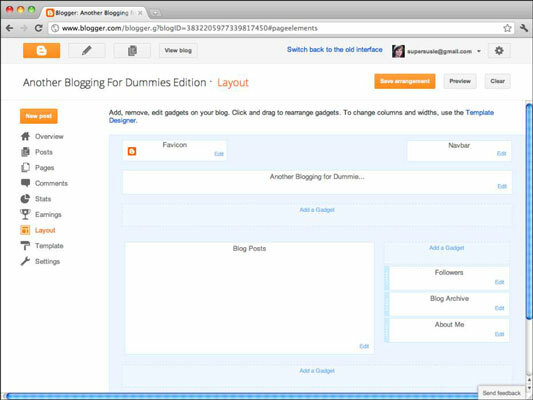 In the Layout screen, a wireframe of your blog template appears. A wireframe is a visual representation of the template layout that uses only outlines, or boxes, of the elements. Move page elements. Click and drag them to a new position. Preview edits that you’ve made. See how your changes look before you save them to your blog by clicking the Preview button. Revert to the original version of your template. Click the Clear Edits button. You can also remove many elements on the page. Click Edit and look for a Remove button for anything you don’t want to include on your blog. Don’t worry if you change your mind later — you can always add them back in.